Pyramid E&C builds topping refineries which are suitable for light, low sulphur crudes to produce automotive fuels, i.e., Diesel and Gasoline from Crude Oil and Condensate. 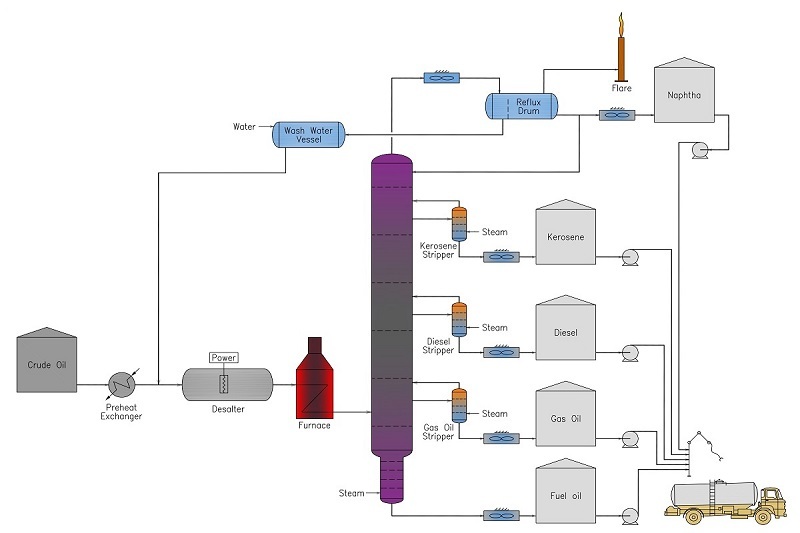 The building blocks of these refineries include desalting, atmospheric distillation, and side stream stripping. The yields and the treatment required depend on the API gravity, sulphur, and other properties of the crude. Utilities include a fuel gas system and tanks for product storage. Crude oil is first treated in a desalter unit where salt in water, or brine, is removed. The crude oil is heated in a fired heater from which it enters the flash zone of an atmospheric column. Natural gas condensate can also be included in the feed or introduced directly into the column. The crude oil mixture is separated into different cuts by boiling range. The crude column produces naphtha, kerosene, and diesel as the side streams. The crude column bottoms, also called reduced crude, is used as fuel oil. In large atmospheric columns, pump a rounds are used for intermediate heat recovery to the crude feed which reduces furnace firing. For small refineries on the order of 10,000 BPD, often CAPEX is minimized by allowing all heat removal to occur in the overhead condenser. Products are withdrawn from the tower under temperature control; by modelling the tower, it is possible to predict the temperature, pressure, and number of trays required to produce the desired product specifications. The tower products are stripped of light ends using steam or reboilers. This controls the front end specification such as flash point on the product.